2. Paula Deen was way out of line in accusing AJ Ellis of being a "white trash piece of (&&@%($@! *%@%"
4. Cliche alert: one game at a time...plus something about All Star Game break. 5. NSA monitored the GT and deemed it and its participants "mostly harmless." Who wants to go to the game Monday? Good thing I stayed away from the GT. NSA has been monitoring me. Tickets bought for the Gnats on Monday. Hope to see some SOSGs there! You just had to hang out with Basque separatist on the last southern euro tour. @PJ: They were midgets. I thought they were circus folk. But they did inspire our hit song, "Four foot one and a ton of fun." Don't forget "Basque Beer Blues"
NSA also monitoring Dodger offense deeming it also mostly harmless. Carlos Quentin's line (he batted fourth): 0-for-3 with 2 Ks and 2 LOB. 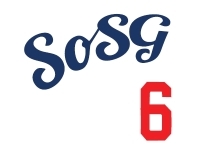 Early game tomorrow, boys and girls, but the SoSG bar is still open. Bloody Mary, please. Extra spicy.